In Kanye West’s song Power, he said “No one man should have all that power”. After using Powerbag‘s Instant Messenger, it is obvious Kanye was singing about someone using a Powerbag. If you have a smart phone or tablet you already know the fastest way to drain it’s battery is to play games on in it. Because of that, I’m sure you have a pocket (or pockets) dedicated to holding the multiple charging bricks and cables needed help you make it through the day. That all changed for me when I started using Powerbag’s Instant Messenger. Before that I carried, always carried around two chargers, one Apple charger for my iPod and iPad and one USB mini charger for my phone and Kindle Fire. Now they sit in a drawer at my house. The Powerbags have a built in older for their 3000, 6000, or 9000mAH batteries. Depending on which size battery you choose, you can charge your cell phone or other device between 2 and 6 times without needing to recharge the bag’s battery. My favorite part about this bag is the two pockets on the outside of the main compartment. The right outside pocked features a Apple 30-pin dock connector so you can easily plug in your iPod or iPhone. On the left side pocket there is a cable that features both a mini and micro USB jack that will charge most other phones. If your phone or tablet requires another jack, you can connect it to the battery via a USB port inside main compartment. Initially when I got this in, I was worried that the battery pack was going to make this bag heavy. However, the battery pack only weights about as much as two decks of cards. So the weight is barely noticeable. The size of the battery and dock are about that of a Nintendo DS. They even have an ingeinous way of charging the battery without taking it out of the bag. On the front is a little flap concealing a port that you can plug a wall wart to charge the battery. Of course the charging system is what makes this bag shine, what you will also realize is that this is a top of the line messenger bag. 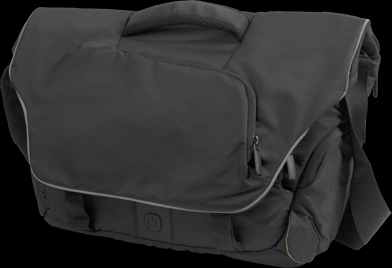 Even if this didn’t have the power system I would consider this among the best bags I’ve used. On a normal day I carry a 13in laptop, iPad, Kindle Fire, PS Vita, iPod, and netbook in the bag with plenty of room to spare. 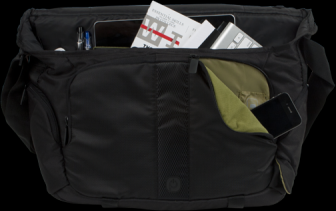 Aside from messenger bags, Powerbag also carries a nice variety of backpacks and briefcases. It is pretty obvious to me that if you carry a bag and even have as little to charge as a cell phone, you should be carrying a Powerbag. As an Android phone owner, I can highly recommend this to anyone who is consistently going to their car at the end of the work day and and seeing your phones power indicator at yellow or red. The Powerbag Instant Messenger is available at many retail stores and is also available online retailing for $179.99.